Treehouse Cottage - The Crags Accommodation. TreeHouse Cottage is situated in a very quiet, rural Estate surrounded by indigenous forest in the Crags, near Plettenberg Bay. The owners of the cottage are artists, Sally Rush and Margaret Knight. They are great nature-lovers and particularly great bird-lovers, as is obvious by the extraordinary bird-life which have been encouraged to visit over the years and now are seen in the garden every day. Even the Knysna Loerie (Turaco) is almost certain to be seen daily. Please feel welcome to ask them to see their studio, where they produce their fine art works. This cute wooden cottage has a separate entrance and secure parking, with stunning views of the forest. There is a charming wooden deck, with a Weber Braai, and a peaceful and private place to sit and enjoy the birdlife and sounds of nature. 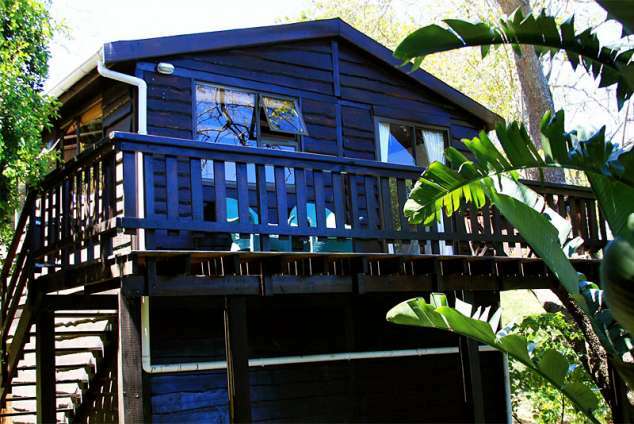 Treehouse Cottage is open-plan and consists of a living area with DSTV and a decoder. There is a double bed and two small single beds (suitable for children), and a modern bathroom with a shower. There is also a fan and a heater to ensure your comfort throughout the year. There is free Wi-Fi. The cottage is fully equipped for self-catering and is not serviced except for longer stays. Tea, coffee and basic essentials are provided, as well as all linen. Treehouse Cottage is in Ashlands Estate, in Askop Road which has an automatic boom with a security camera which closes the road to traffic at night, simply as a safety precaution, it works extremely well! We have no crime problems and feel very safe walking around outside during the day and night, but don't forget to ask for the code for the boom so that you can get in and out at any time. Ashlands also has an automatic gate and you will be given a remote for both. This is the perfect place to relax and discover the Garden Route and our beautiful indigenous forest in a friendly, safe and very beautiful environment! Maximum 2 adults,(maximum 4 people). Askop Road is home to Hog Hollow Horse Riding as well as the famous Plett Barnyard Theatre which hosts many events throughout the year and you can walk there! There are also many animal sanctuaries in close proximity. These include Monkeyland, Birds of Eden, the Elephant Sanctuary, the Lawnwood Snake Park and Tenikwa Wildlife Sanctuary. Just a bit further is Plettenberg Bay Game Reserve and many action sports like swimming with the seals, whale and dolphin watching, deep sea fishing, abseiling, canyoneering, bungi -jumping and sky-diving. Hiking in the forests or beaches is popular because of our spectacular scenery and the birdlife is extraordinary! Nature's Valley is also just a short distance away. The white sands and clear blue waters provide the perfect setting to while-away lazy afternoons. Other beautiful beaches include Robberg and Keurbooms. The area has also become well known for polo, and has been producing very fine wines in recent years! Bramon Wine Farm are our neighbours and you are a five minute drive away from their wine-tasting and excellent restaurant which specializes in tapas food of a very high quality. The Mill Centre is also nearby with its various craft shops and the Pepper Mill restaurant. Plettenberg Bay is an easy 20 minute drive away, with many more fine dining opportunities and plenty shopping! Please place recyclables in the bin provided. (All cottages) Please ask for more black/green bags if you need them. Compostables can be placed in the tupperware bin provided in the kitchen and then emptied into the compost bin opposite the cottage. Recyclables in green bags please. Oil / fat – please wrap in the newspaper provided and throw in the black bags and not in our garden! We have septic tanks so PLEASE don’t put anything except toilet paper in the toilets and no fat down the kitchen sink. Thank you! We like to look after our beautiful environment and in our experience, so do our guests! 2 Ashlands, Askop Road, The Crags. Take the N2 highway from Plettenberg Bay in the direction of Port Elizabeth. Approximately 17 km outside of Plettenberg Bay, in the Crags, take the Askop Road turn-off to the right. You will see signs for 'Hog Hollow' and 'The Barnyard' at this intersection. Continue for 1 km, and then turn right into Ashlands. You will need to phone us en-route to ensure that we are there to let you into the security gate. The property is directly in front of the gate at the bottom of the driveway. Once you have driven through the toll booth at Tsitsikamma, keep your eyes peeled. Within a few kilometres you will drive past the Nature’s Valley turnoff on your left and then Kurland Village, which is where the Sanctuaries are located. (Also called Animal Alley). Another couple of kilometres and you will take the turnoff to Askop Road on your left. Please notify us in advance of your approximate arrival time so that we can be there to meet you with the keys. We have a boom in Askop Road which closes at 6.30pm until 6.30 am in the mornings. You will not be able to enter without our assistance. Upon arrival you will be given a remote for your use for the duration of your stay. Your establishment is gay managed? Detail description : Spectacular birdlife. The Knysna Turaco (Loerie) is seen daily and the owners have been encouraging the birds to visit for 17 years. Surrounded by forest, it is simply outstanding! 771 page views since 16 May, 2018.